An action-adventure game in a fantasy setting inspired by Arabian myth. We are taken to the desert land of Noshrac, which is at the edge of annihilation by the invading army of the Sarahul Empire, and take control of a warrior. 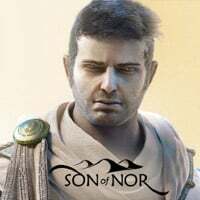 Son of Nor is a fantasy adventure action game inspired by Arabic mythology. It was developed by StillAlive. The action takes place in a desert fantasy world called Noshrac, which stands at the brink of doom, because of the invading army of the ancient enemy - the Sarahul. The players assume the role of one of the warriors sent out to find the way to stop the invasion. The task is not easy as the sea of sand has become a home to many aggressive monsters. What’s worse, Sarahul scouts are already there, not only warriors, but also powerful warlocks. Luckily, the protagonist is anything but defenseless – he’s got a large arsenal of powers. The powers are divided into three categories. Telekinesis allows for using the surroundings to fight, for example by throwing rocks at enemies or triggering traps. Terramorphing is used to manipulate the desert’s shape, erecting barriers, slowing down enemies and making your own paths. The protagonist also knows magic based on control of elements, including fire, air and life essence. All of this was created to reward the player's creativity. Defeating a large group of enemies takes much cunning, and every problem may be solved in a few ways. Apart from the solo campaign, the game also offers a co-op mode for up to four players. Expectations: 8.5 / 10 calculated out of 5 players' votes.